I began the Journal of Seeing blog on October 19,2010 with a photograph of my older brother Ronald and I sitting outside on the steps of our house. I was about five years old. I have decided to repost some of the images I have posted during the last seven years. They are photographs I have taken and art I have created. This photo was taken about 2004 with my first digital camera, a Minolta Damage 5414. The morning sun was casting shadows of a vase , bottle and drink glass. The reflection-refraction of the sun passing through the glass caught my eye. The title I gave to this image is “Morning Sun”. My photograph “crown of Light ” was taken with my first digital camera, about twelve years ago. The camera was a Minolta Dimage S414 and was 4 mega pixels. Taking photographs with a digital camera gave me the freedom to record images I would not have taken, because of the cost of developing prints from film. This also changed the way I looked at the visual world around me. This was one of the first photos I took of a caustic light. I saw this image on the living room floor and it came from the brass frame around a fireplace door. After recording this image I began to observe and record light. Not the way light falls on objects,which I have painted many times but light as an object. I think of these photographs as light poetry. I have also called this photograph “crown of thorns”. I thought this image would be appropriate to follow my Good Friday post. I captured this reflection with my first digital camera about seven years ago. The only enhancement to the photo was to increase the contrast. 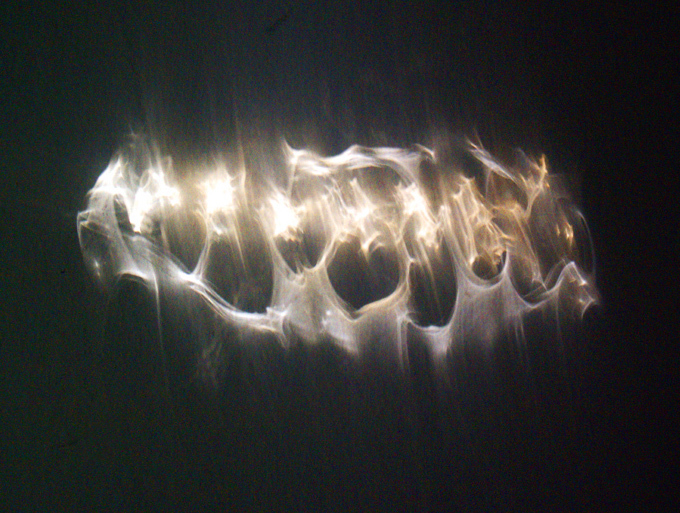 This was a reflection of light bouncing off the brass doors of our fireplace that appeared on our living room floor.